Government report shows 15% of Americans had trouble putting food on the table -- a record high. U.S. assistance to food banks rose in 2009 with Recovery Act funding, after a record number of Americans struggled to put food on the table in 2008, a new report found. NEW YORK (CNNMoney.com) -- The number of Americans that have trouble putting food on the table shot up last year in an unprecedented spike to a record 17 million households, the government reported on Monday. The Department of Agriculture report, which has been released annually since 1995, said the number of Americans that were hungry rose to 14.6%. In 2007, 13 million households or 11.1% of Americans had trouble getting enough food. The one-year jump is all the more significant, given the number of hungry Americans had never been higher than 11.9% since these surveys began. Of the near-15% of the nation that couldn't secure enough food last year, the USDA said one-third of them had "very low food security," meaning they reduced the amount that they ate or disrupted their eating patterns during the year. That group made up 5.7% of all U.S. households, which was also a record high. More than 500,000 households that scaled back the amount that they ate were households with children, making up 1.3% of all U.S. homes with children. 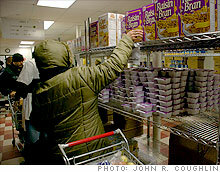 The USDA said the main cause of hunger and food insecurity in the country is poverty. Obama's call to action. President Obama called the report "unsettling," and said more needs to be done. "My Administration is committed to reversing the trend of rising hunger," Obama said in a statement. "The first task is to restore job growth, which will help relieve the economic pressures that make it difficult for parents to put a square meal on the table each day. But we are also taking targeted steps to prevent Americans from experiencing hunger." Obama urged Congress to pass a "strong" child nutrition bill to help ensure that American children don't go hungry. To combat the nation's rapidly growing hunger problem, the Recovery Act allocated $20 billion to the nation's food stamp program, and hundreds of millions of dollars to food banks and school lunch programs. One recipient of stimulus funds was the USDA's Emergency Food Assistance Program, which was allocated an additional $150 million from the $787 billion economic stimulus plan. The 28-year old program, known as TEFAP, sends shipments of federally purchased food to states, which in turn gets the food in the hands of large food banks. The food banks then allocate the food to soup kitchens and pantries that serve people in need. The $150 million for TEFAP provided by stimulus about doubled the amount of money already allotted to the program this year. Feeding America, a network of more than 200 food banks that advocates in Washington for food assistance programs, said its member food banks reported a 30% increase in the number of people seeking assistance earlier this year, and 72% of food banks had been unable to adequately meet demand before the stimulus bill was enacted.